The ACXT145 features NOAA weather channels as well as all 22 FRS/GMRS channels with a maximum range of up to 16 miles in optimal conditions (typically less than a mile in urban conditions). The CXT 145 has the basic features you would expect in a standard, entry level radio for typical family use, such as auto squelch, battery saver, call alert tone, keystroke tones, LCD screen, low battery indicator and a roger beep. This value pack includes two Cobra CXT145 two way radios with attached belt clips, dual adapter Micro-USB plug-in charger, NiMH rechargeable batteries and an owner's manual. Made of extremely durable ballistic polypropylene and available in a wide range of universal sizes, this tough cell phone case for mobile devices of nearly every model, with or without a form fit case, absorbs shocks and shields from the elements. Its patented flex-clip attaches securely over and under your belt, fully rotates for access at any angle, and even locks in eight different positions. Featuring internal pockets and an integrated pen loop, this ultra-functional mobile device case also holds your smaller items like ID, cash, and credit cards for extra convenience. And to top it all off, we've added our Tooth Ferry feature to keep your wireless headset or headphones safe and available. Absolutely perfect for those who work and play in rugged environments, and don't want their phones to suffer for it. Perfect for the toughest work and hardest play, our Clip Case Cargo is an innovative accessory for high-tech devices in rugged environments. From the materials used to the method of construction, the Clip Case Executive Holster XXL is made with attention to every last detail, to sleekly attach even the largest smartphone securely at your belt. The case is constructed with an exterior of the highest quality black genuine leather, finely stitched and lined with a soft, non-scratch interior. Durable hook & loop closure keeps your phone safe and secure, and its super strong clip fits on belts up to 2 3/16 inch wide. But most importantly, this smartphone case has a slim, low profile that makes it appropriate to wear to big investor meetings, casual Fridays, and everything in between. 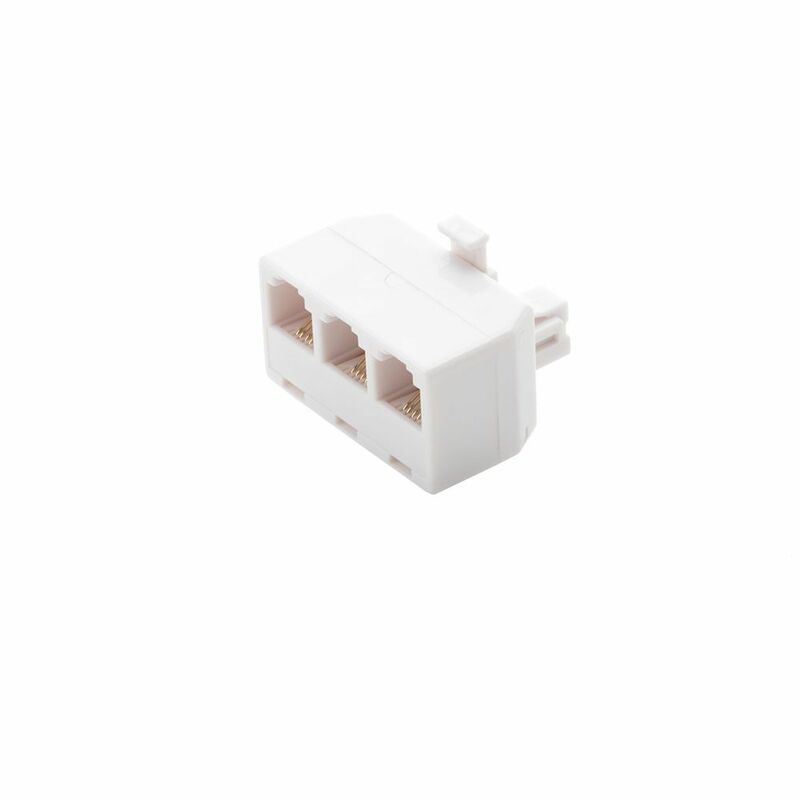 3-Way Telephone Splitter Conveniently attach a pair of phone cords with the CE-TECH White In-Line Coupler to extend the length of a device's reach. This coupler offers 4 conductors. It have a white finish. 3-Way Telephone Splitter is rated 2.0 out of 5 by 4. Rated 5 out of 5 by Joe from Too many times I’ve gone to our local ‘hardware’ store... Too many times I’ve gone to our local ‘hardware’ store and been told, “It didn’t sell, we discontinued it.” It’s gratifying that Home Depot continues to be a reliable source of needed items. Rated 1 out of 5 by iceron from Very Bad I plug in the 3 way spliter and get an intermittent connection. When I plug directly into the phone jack, I get a solid connection. The three way spliter is responsible for the bad connection. Rated 1 out of 5 by iceron from Lousy I plug in the 3 way spliter and get an intermittent connection. When I plug directly into the phone jack, I get a solid connection. The three way spliter is responsible for the bad connection. Rated 1 out of 5 by MizzJ from Junk The jack that you plug into the wall outlet is flimsy and does not stay attached to the wall outlet. You cannot adjust the tension to make it stay. If you move any cords, for any reason, this entire unit will fall right out. Worthless!